For Gift of Hope, an organization committed to raising awareness about the importance of organ and tissue donations, 2014 represents 365 new opportunities to continue serving and supporting the Latino community. “It is impressive and touching to see the enormous desire in our community to help the less fortunate. Every time we ask them to join us to help raise funds for our Latino students or to collect toys for our sick children in hospitals, our Latino community is present”, Manager of Hispanic Affairs for Gift of Hope Raiza Mendoza said. 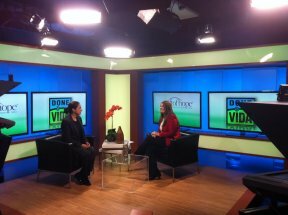 Among the many efforts that Mendoza will carry out on behalf of Gift of Hope include “Despierta Chicago” a segment transmitted by Univision Chicago and in that same media she will conduct the program “Sin Condición”, aired by Univisión, Telemundo, Cable 25 and Mundo FOX. Gift of Hope will expand their radio presence through programs like “Dona Vida” on Radio Vive and “Anonymous Heroes” on Radio Máxima 93.5FM and 103.1FM. Mendoza also participates in “Mujeres Sin Censura”, a new edition of Vicente Serrano’s radio program on 1590AM of which Raiza Mendoza is one of the presenters. Gift of Hope will increase their community activities and will continue their efforts to inform and educate as many Latinos as possible about their mission of spreading hope and saving lives.